Lymphedema is the build-up of fluid in soft body tissues when the lymph system is damaged or blocked. Lymphedema occurs when the lymph system is damaged or blocked. Fluid builds up in soft body tissues and causes swelling. It is a common problem that may be caused by cancer and cancer treatment. Lymphedema usually affects an arm or leg, but it can also affect other parts of the body. Lymphedema can cause long-term physical, psychological, and social problems for patients. The lymph system is a network of lymph vessels, tissues, and organs that carry lymph throughout the body. Lymph: A clear fluid that contains lymphocytes (white blood cells) that fight infection and the growth of tumors. Lymph also contains plasma, the watery part of the blood that carries the blood cells. Lymph vessels: A network of thin tubes that helps lymph flow through the body and returns it to the bloodstream. The spleen, thymus, tonsils, and bone marrow are also part of the lymph system but do not play a direct part in lymphedema. Anatomy of the lymph system showing the lymph vessels and lymph organs, including the lymph nodes, tonsils, thymus, spleen, and bone marrow. 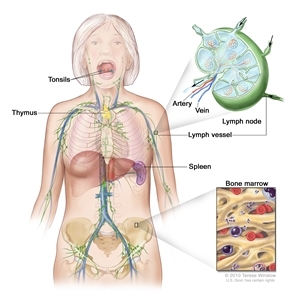 Lymph (clear fluid) and lymphocytes travel through the lymph vessels and into the lymph nodes where the lymphocytes destroy harmful substances. The lymph enters the blood through a large vein near the heart. Lymphedema occurs when lymph is not able to flow through the body the way that it should. When the lymph system is working as it should, lymph flows through the body and is returned to the bloodstream. Fluid and plasma leak out of the capillaries (smallest blood vessels) and flow around body tissues so the cells can take up nutrients and oxygen. Some of this fluid goes back into the bloodstream. The rest of the fluid enters the lymph system through tiny lymph vessels. These lymph vessels pick up the lymph and move it toward the heart. The lymph is slowly moved through larger and larger lymph vessels and passes through lymph nodes where waste is filtered from the lymph. The right lymph duct collects lymph from the right arm and the right side of the head and chest. The left lymph duct collects lymph from both legs, the left arm, and the left side of the head and chest. These large ducts empty into veins under the collarbones , which carry the lymph to the heart, where it is returned to the bloodstream. When part of the lymph system is damaged or blocked, fluid cannot drain from nearby body tissues. Fluid builds up in the tissues and causes swelling. There are two types of lymphedema. Primary lymphedema is caused by the abnormal development of the lymph system. Symptoms may occur at birth or later in life. Secondary lymphedema is caused by damage to the lymph system. The lymph system may be damaged or blocked by infection, injury, cancer, removal of lymph nodes, radiation to the affected area, or scar tissue from radiation therapy or surgery. This summary is about secondary lymphedema in adults that is caused by cancer or cancer treatment. Possible signs of lymphedema include swelling of the arms or legs. Swelling of an arm or leg, which may include fingers and toes. A full or heavy feeling in an arm or leg. A tight feeling in the skin. Trouble moving a joint in the arm or leg. Thickening of the skin, with or without skin changes such as blisters or warts. A feeling of tightness when wearing clothing, shoes, bracelets, watches, or rings. Itching of the legs or toes. A burning feeling in the legs. Daily activities and the ability to work or enjoy hobbies may be affected by lymphedema. These symptoms may occur very slowly over time or more quickly if there is an infection or injury to the arm or leg. Cancer and its treatment are risk factors for lymphedema. Removal and/or radiation of lymph nodes in the underarm, groin, pelvis, or neck. The risk of lymphedema increases with the number of lymph nodes affected. There is less risk with the removal of only the sentinel lymph node (the first lymph node to receive lymphatic drainage from a tumor). Slow healing of the skin after surgery. A tumor that affects or blocks the left lymph duct or lymph nodes or vessels in the neck, chest, underarm, pelvis, or abdomen. Scar tissue in the lymph ducts under the collarbones, caused by surgery or radiation therapy. Lymphedema often occurs in breast cancer patients who had all or part of their breast removed and axillary (underarm) lymph nodes removed. Lymphedema in the legs may occur after surgery for uterine cancer, prostate cancer, lymphoma, or melanoma. It may also occur with vulvar cancer or ovarian cancer. Tests that examine the lymph system are used to diagnose lymphedema. Lymphoscintigraphy: A method used to check the lymph system for disease. A very small amount of a radioactive substance that flows through the lymph ducts and can be taken up by lymph nodes is injected into the body. A scanner or probe is used to follow the movement of this substance. Lymphoscintigraphy is used to find the sentinel lymph node (the first node to receive lymph from a tumor) or to diagnose certain diseases or conditions, such as lymphedema. The swollen arm or leg is usually measured and compared to the other arm or leg. Measurements are taken over time to see how well treatment is working. A grading system is also used to diagnose and describe lymphedema. Grades 1, 2, 3, and 4 are based on size of the affected limb and how severe the signs and symptoms are. Stages may be used to describe lymphedema. Stage I: The limb (arm or leg) is swollen and feels heavy. Pressing on the swollen area leaves a pit (dent). This stage of lymphedema may go away without treatment. Stage II: The limb is swollen and feels spongy. A condition called tissue fibrosis may develop and cause the limb to feel hard. Pressing on the swollen area does not leave a pit. Stage III: This is the most advanced stage. The swollen limb may be very large. Stage III lymphedema rarely occurs in breast cancer patients. Stage III is also called lymphostatic elephantiasis. Patients can take steps to prevent lymphedema or keep it from getting worse. Taking preventive steps may keep lymphedema from developing. Health care providers can teach patients how to prevent and take care of lymphedema at home. If lymphedema has developed, these steps may keep it from getting worse. Tell your health care provider right away if you notice symptoms of lymphedema. See the General Information section for symptoms that may be caused by lymphedema. Tell your doctor right away if you have any of these symptoms. The chance of improving the condition is better if treatment begins early. Untreated lymphedema can lead to problems that cannot be reversed. Keep skin and nails clean and cared for, to prevent infection. Use cream or lotion to keep the skin moist. Treat small cuts or breaks in the skin with an antibacterial ointment. Avoid needle sticks of any type into the limb (arm or leg) with lymphedema. This includes shots or blood tests. Use a thimble for sewing. Avoid testing bath or cooking water using the limb with lymphedema. There may be less feeling (touch, temperature, pain) in the affected arm or leg, and skin might burn in water that is too hot. Wear gloves when gardening and cooking. Wear sunscreen and shoes when outdoors. Cut toenails straight across. See a podiatrist (foot doctor) as needed to prevent ingrown nails and infections. Keep feet clean and dry and wear cotton socks. Avoid blocking the flow of fluids through the body. It is important to keep body fluids moving, especially through an affected limb or in areas where lymphedema may develop. Change sitting position at least every 30 minutes. Wear only loose jewelry and clothes without tight bands or elastic. Do not carry handbags on the arm with lymphedema. Do not use a blood pressure cuff on the arm with lymphedema. Do not use elastic bandages or stockings with tight bands. Keep blood from pooling in the affected limb. Keep the limb with lymphedema raised higher than the heart when possible. Do not swing the limb quickly in circles or let the limb hang down. This makes blood and fluid collect in the lower part of the arm or leg. Do not apply heat to the limb. Damage to the lymph system cannot be repaired. Treatment is given to control the swelling caused by lymphedema and keep other problems from developing or getting worse. Physical (non-drug) therapies are the standard treatment. Treatment may be a combination of several of the physical methods. The goal of these treatments is to help patients continue with activities of daily living, to decrease pain, and to improve the ability to move and use the limb (arm or leg) with lymphedema. Drugs are not usually used for long-term treatment of lymphedema. Pressure garments are made of fabric that puts a controlled amount of pressure on different parts of the arm or leg to help move fluid and keep it from building up. Some patients may need to have these garments custom-made for a correct fit. Wearing a pressure garment during exercise may help prevent more swelling in an affected limb. It is important to use pressure garments during air travel, because lymphedema can become worse at high altitudes. Pressure garments are also called compression sleeves and lymphedema sleeves or stockings. Talk with a certified lymphedema therapist before beginning exercise. Breast cancer survivors should begin with light upper-body exercise and increase it slowly. Some studies with breast cancer survivors show that upper-body exercise is safe in women who have lymphedema or who are at risk for lymphedema. Weight-lifting that is slowly increased may keep lymphedema from getting worse. Exercise should start at a very low level, increase slowly over time, and be overseen by the lymphedema therapist. If exercise is stopped for a week or longer, it should be started again at a low level and increased slowly. Once the lymph fluid is moved out of a swollen limb, bandaging (wrapping) can help prevent the area from refilling with fluid. Bandages also increase the ability of the lymph vessels to move lymph along. Lymphedema that has not improved with other treatments is sometimes helped with bandaging. The goal of skin care is to prevent infection and to keep skin from drying and cracking. See skin care tips, in the Managing Lymphedema section. Combined physical therapy is a program of massage, bandaging, exercises, and skin care managed by a trained therapist. At the beginning of the program, the therapist gives many treatments over a short time to decrease most of the swelling in the limb with lymphedema. Then the patient continues the program at home to keep the swelling down. Combined therapy is also called complex decongestive therapy. Compression devices are pumps connected to a sleeve that wraps around the arm or leg and applies pressure on and off. The sleeve is inflated and deflated on a timed cycle. This pumping action may help move fluid through lymph vessels and veins and keep fluid from building up in the arm or leg. Compression devices may be helpful when added to combined therapy. The use of these devices should be supervised by a trained professional because too much pressure can damage lymph vessels near the surface of the skin. In patients who are overweight, lymphedema related to breast cancer may improve with weight loss. Laser therapy may help decrease lymphedema swelling and skin hardness after a mastectomy. A hand-held, battery-powered device is used to aim low-level laser beams at the area with lymphedema. Lymphedema is not usually treated with drugs. Antibiotics may be used to treat and prevent infections. Other types of drugs, such as diuretics or anticoagulants (blood thinners), are usually not helpful and may make the lymphedema worse. Lymphedema caused by cancer is rarely treated with surgery. Massage therapy (manual therapy) for lymphedema should begin with someone specially trained in treating lymphedema. In this type of massage, the soft tissues of the body are lightly rubbed, tapped, and stroked. It is a very light touch, almost like a brushing. Massage may help move lymph out of the swollen area into an area with working lymph vessels. Patients can be taught to do this type of massage therapy themselves. Open wounds, bruises, or areas of broken skin. Tumors that can be seen on the skin surface. Areas with deep vein thrombosis (blood clot in a vein). Sensitive soft tissue where the skin was treated with radiation therapy. When lymphedema is severe and does not get better with treatment, other problems may be the cause. Sometimes severe lymphedema does not get better with treatment or it develops several years after surgery. If there is no known reason, doctors will try to find out if the problem is something other than the original cancer or cancer treatment, such as another tumor. Lymphangiosarcoma is a rare, fast-growing cancer of the lymph vessels. It is a problem that occurs in some breast cancer patients and appears an average of 10 years after a mastectomy. Lymphangiosarcoma begins as purple lesions on the skin, which may be flat or raised. A CT scan or MRI is used to check for lymphangiosarcoma. Lymphangiosarcoma usually cannot be cured. Check the list of NCI-supported cancer clinical trials for supportive and palliative care trials about lymphedema that are now accepting participants. For more specific results, refine the search by using other search features, such as the location of the trial, the type of treatment, or the name of the drug. This PDQ cancer information summary has current information about the causes and treatment of lymphedema. It is meant to inform and help patients, families, and caregivers. It does not give formal guidelines or recommendations for making decisions about health care.